Dwayne “The Rock” Johnson eats more than two pounds of cod per day for his insane diet, and unsurprisingly, candy is never a factor. 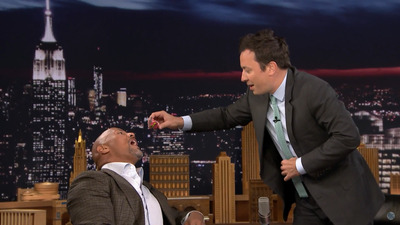 During an appearance on Jimmy Fallon’s “The Tonight Show” on Thursday, Johnson told Fallon that he hasn’t even eaten a piece of candy since 1989. It was a Twizzler, and he was at the movie theatre. Knowing this, Fallon of course tempted Johnson to “make a little history” and eat candy for the first time in 27 years. Instead, Fallon attempted to lure Johnson with a giant gummy worm, a Nerd Rope, and Ring Pops before ultimately convincing The Rock to eat Pop Rocks and hold up a microphone so the crackling could be heard. “So that’s what candy tastes like! Wow, it’s amazing,” Johnson said.